The Votrax SC-01A Speech Synthesizer is a phoneme synthesizer of the early 1980's. It is capable of unlimited English speech using a stream of phoneme codes as input. All transitions between phonemes are handled automatically. (It thus stands in contrast to most other synthesizers of that time--see below.) It was based on work by Richard Gagnon, and later was enhanced to become the SC-02, more widely known as the SSI-263. This page has some resources that might be useful to the person studying or using the SC-01A. The speech it produces is of quite high quality for the time (and for a single-chip IC). It rates reasonably well in intelligibility, but is not very natural sounding. 64 different phonemes are available, and 4 levels of intonation. Brief comments on the SC-02 / SSI-263 / "Artic 263"
The SSI-263 (or whatever you prefer calling it) is quite an upgrade from the SC-01; it has many more control registers, a different package and pinout, and so on. As far as I know, it has the same analog formant synthesis core as the SC-01, and is also capable of intelligible (but not necessarily natural sounding) speech. “Last buy” was likewise many years ago, so any supplies are NOS. See below for SSI-263A datasheet and user guide. The bottom line? Single-chip analog formant synthesis is likely down for the count. There are some recent offerings (DSP based), though, that could fill the niche of single-chip phoneme synthesizer--see below under Modern Alternatives. Note about audio output from a reader named Cobey: "I wanted to let you know that there are errors on the "9 page recommended" datasheet. If the chip is connected as shown in Fig. 11 or Fig. 13, the audio output will not operate correctly and either be heavily distorted or silent. The "10 page poor" datasheet seems to be a revision which has some extra information including how to calculate clock frequency, proper termination of TP3 and corrected Fig. 11 and 13 (ignoring the scan error in fig. 11)." I scanned in a copy of the SC-01 data sheet. It is in PDF format, but in fact it is entirely bit-mapped graphics (i.e., it has not been converted to actual text). The resolution is 300 DPI. It is readable for the most part, though some small heavy fonts are hard to read. By the way, after running into a dead-end trying to get permission from Votrax to post this data sheet (they sent me to Artic Technologies, also in the Detroit area, who never got back to me), I noticed the explicit permission granted on the first page to reproduce this data sheet. So feel free to redistribute as you like. Update--12/07: Bob Grieb was kind enough to furnish an excellent scanned copy of the datasheet. It is scanned at 600 dpi, I think, and the original is loads better than anything else I've seen. I've kept the old copies here as well. If you have an SC-01A datasheet, or related material that could be posted, please let me know. What is the difference? Klatt's review paper below states there is a quality difference between the two. Can anyone go into more detail on the differences? So some SSI elements became part of TI's Storage Products Group (http://www.ti.com/sc/docs/products/storage/index.htm). However, I was in touch (April 2006) with that TI group, and they did not have any information on the 263 (or other chips). They thought that Teridian Semiconductor Corporation (http://www.tsc.tdk.com/) might have retained the speech products. However, my email to them remains unanswered. Anyone have additional information? "Apparently oblivious to all of the prior research detailed earlier, a man experimenting in his basement workshop, Richard Gagnon, designed a synthesis-by-rule program that eventually resulted in the Votrax SC-01 chip. ... It is a remarkable device for the price." No mention of Mozer (of National Semiconductor's speech synthesizer, if I'm remembering correctly), but this is the best article to start with if you want an introduction to the synthesis of speech up to that point. Prochnow, Dave, Chip Talk: Projects in Speech Synthesis, Tab Books, Blue Ridge Summit, PA: 1987. ISBN is 0-8306-1912-7 (hard cover) and 0-8306-2812-6 (paperback). Hardcover is Tab # 2812.
as well as stand-alone systems. Schematics, pin-outs, construction hints. Not much detail on theory. All but certainly out of print, but that's what inter-library loans are for! For a deep account of one text-to-speech system (the basis for some of the best speech synthesizers until perhaps recently), see the book From Text to Speech: The MITalk System, by Allen, Hunnicutt, and Klatt, Cambridge University Press, 1987. (The pseudo-code in the back is not, however, without a number of errors and omissions.) The parameter-to-speech part of MITalk is detailed for the most part in Klatt's "Software for a Cascade/Parallel Formant Synthesizer," J. Acoust. Soc. Am., 67:3, March 1980, pg 971-995. See https://sova.si.edu//record/NMAH.AC.0417/, the Smithsonian Speech Synthesis History Project, which includes audio of a variety of synthesizers, the Klatt paper, and personal recollections. See especially the chronology of Votrax's speech products. Obviously, newsgroups such as comp.dsp, comp.speech. *, comp.arch.embedded, and comp.robotics. *--and their associated FAQ's--are valuable resources. See also http://www.robotprojects.com/voice/voice.htm, by Scott Savage, which has some interesting links on speech synthesizers. (7/2/02) Tom McClintock notes the following: "One item of interest regarding the SC-01a. The 'PinMAME' developers have incorporated SC-01a emulation into their pinball simulations. The source code includes digital representations of all the phonemes. Pretty cool stuff, but complete and accurate emulation is not quite there. Check out the source: http://pinmame.retrogames.com/release/pinmame_112_1_src.zip"
Ciarcia, Steve, "Build a Low-Cost Speech Synthesizer Interface," Byte, June 1981, p 46. Ciarcia, Steve, "Build an Unlimited-Vocabulary Speech Synthesizer," Byte, September 1981, p 38. Ciarcia, Steve, "Build the Microvox Text-to-Speech Synthesizer, Part 1," Byte, September 1982, p 64. Ciarcia, Steve, "Build the Microvox Text-to-Speech Synthesizer, Part 2," Byte, October 1982, p 40. Ciarcia, Steve, "Talk to Me: Add a Voice to Your Computer for $35," Byte, June 1978, p 35. Note that some of these articles are collected in "Ciarcia's Circuit Cellar" volumes I, II, and III. Volume I covers 9/77-11/78, II covers 12/78-6/80, and III covers 7/80-12/81. RB5X Robot (thanks to Ethan Dicks)--still being sold ($3,500), apparently, as of June 2007: http://www.rbrobotics.com/Products/RB5X.htm. While they do list an SC-01A in their parts list, the availability is shown as "call/email". Paul Koning writes: the University of Illinois PLATO system built a number of boxes using the Votrax chip that connect to the external device output of PLATO terminals. They also built support in the PLATO software for this. So you could give a string to the "say" command and it would speak that string on the Votrax box. Because of the limitation of software at the time -- this was around 1975 -- it would not handle regular English, instead it used a somewhat phonetic variant spelling of English (called "world english spelling"). But it did do regular (normally spelled) text to speech for German, Spanish, and Esperanto. It would also accept strings in IPA (International Phonetic Alphabet) so you could have it speak whatever you wanted, within the limitation of the Votrax phonetics of course. The late 70's to mid 80's saw a number of speech synthesis chips developed. Below are brief comments to place some other chips of that era in relation to the SC-01. Philips PCF8200. A digital formant synthesizer, it requires a constant flow of parameters to synthesize speech. Typically these parameters were derived from actual speech, but in theory, you could create these parameters using software (such as Klatt's algorithms) to provide unlimited speech. (Formant parameters are "easily"--and directly--synthesizeable from abstract rules; LPC parameters are not easily directly synthesizeable from sets of rules.) Essentially, a digital version of the formant filters in an SC-01, but without the transitioning logic found in the SC-01 (such transitions in the SC-01 were generated using analog circuitry). National Semiconductor DigiTalker (MM54104). A direct waveform encoding/decoding chip set. Uses ROMs with a limited number of words. Currently available is a line of voice recording chips from ISD (now Winbond). These are even available at Radio Shack and Digikey. However, they are waveform recording devices, so not capable of unlimited speech. Update (12/4/07): Robert Doerr (http://www.robotworkshop.com/) just wrote an article in the December issue of Servo Magazine (http://www.servomagazine.com/) about using a small microcontroller to translate SC-01 phonemes into SpeakJet allophones, plus handle the interface signals so you can plug the circuit into a regular SC-01 22-pin socket. If you need to replace an SC-01, but keep the rest of your circuitry intact (e.g., Hero robot), this could be an interesting solution. Also, Chip Gracey, Parallax founder and the designer of the Propeller chip, has apparently been working on speech synthesis that would run on the Propeller. (See Make magazine volume 10: http://www.make-digital.com/make/vol10/?pg=78&search=parallax+propeller+speech&u1=texterity&cookies=1.) Anyone with additional information? If it ran on just one of the eight 32-bit processors (which should be quite realistic), this would be interesting for new embedded applications. (7/2/02) Robert Doerr points out a newish chip from Winbond, the WTS701, which includes text-to-speech algorithms. http://www.winbond.com/E-WINBONDHTM/partner/b_2_a_5.htm. (5/14/03) Tom Arnold points out that the datasheet is finally available for the WTS701, along with a live demo (you type in text, get back audio output) From the description, it sounds like it stores speech (using the ISD technology) on chip, concatenating to form the output. (See their FAQ on the page above.) Surface mount package. SPI interface. Update (7/11/12): Eric Ostendorff pointed out the RoboVoice SP0-512 Text to Speech IC. http://www.speechchips.com/shop/item.aspx?itemid=22. About $25 ($15.99 on special as of 7/11/12). A pre-programmed dsPIC33FJ64GP802 PIC microcontroller (Microchip), it claims an 800-rule TTS algorithm, built-in DAC, serial communication. Eric has written an article about the RoboVoice in the November 2012 Servo magazine. Here's a link to a video he made. Update (7/11/12): Eric Ostendorff also sent a link to a module, the Emic 2 Text-to-Speech Module, $59.95 from Parallax. It is based on a single-chip TTS from Epson, the V30120, and also has a 32-bit Freescale ColdFire micro—I suppose to make the interface easier? The V30120 embeds the Fonix DECtalk TTS engine, communication is SPI. The package is TQFP 13-64, so not the most DIY-friendly. I see Mouser can order the V30120 in minimum qty 401 in 14 weeks lead time for $6.17 a piece. This is very interesting! They also appear to make some chips that provide additional features such as MP3 decoding, etc., in addition to the TTS. Languages supported by this chip are US English, Castilian Spanish, and Latin American Spanish. "Working Voltage :3.3-5V; Interface Type : TTL serial port, default baud rate 9600; Providing speakers Interface; Providing 3.5 headphone jack; Compatible with Xbee socket"
As for speech synthesis by concatenation ("why not just record all 64 sounds from the SC-01 and string them together as you want? "), see the comment at the bottom of this page. Please note that I do not have any SC-01A's or 263's for sale. (8/2010) Kevin Keinert offers SC-01A's for $41 (qty 1) at http://mysite.verizon.net/res8aiig/ICparts/ICparts.htm, along with SP1000, SP0250, TMS5200, and others. (8/2010) A source for some speech chips (not including the SC-01A): http://www.speechchips.com/shop/ They sell the SpeakJet, SP0256-AL2, and others. Formant: A peak in the spectrum of speech corresponding to a resonance in the vocal tract. A formant synthesizer uses bandpass filters, typically, to create these resonances. Depending on the type of speech to be synthesized (e.g., female, male), four or usually five or more formants are necessary for reasonable speech. Phoneme: An abstract sound unit, for example a sound like "eh". The problem is that the actual sound associated with a phoneme depends on its context--the "eh" sound is influenced by what sounds precede and follow it, for example. 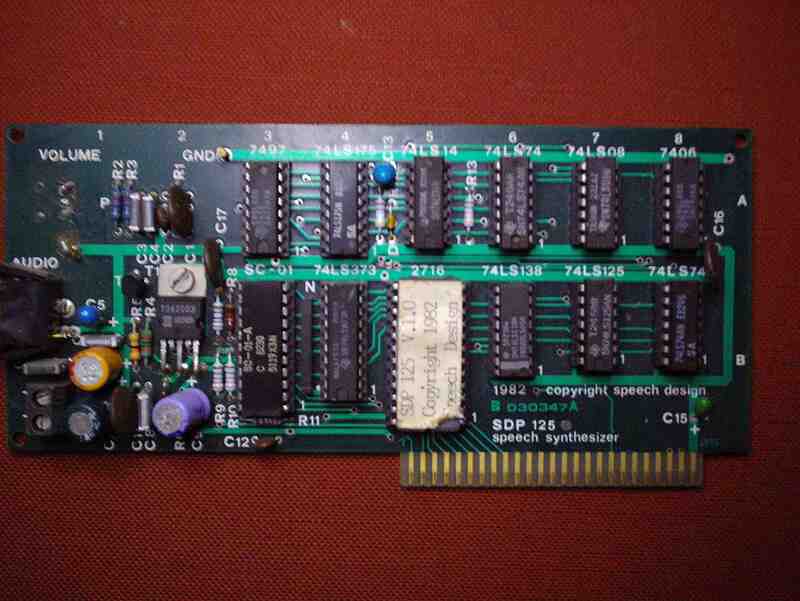 The SSI-263 has some 60 phonemes it uses to synthesize English speech. Allophone: The actual realization of a phoneme (i.e., in a particular context). More than one allophone can be associated with a given phoneme. One idea that seems to come up when discussing the SC-01A (specifically, the lack of availability), is that of creating a software emulation by recording the 60+ phonemes and just concatenating them. It turns out that much of the intelligibility of speech is wrapped up in the transitions between the ideal phoneme sounds ("targets"), so the concatenated speech will sound no where near as good as the SC-01, which has internal circuitry to generate transitions. In fact, there's a speech synthesis method based on just concatenating the transitions between phonemes, called diphone synthesis.